This is a new service which takes advantage of the fact that Google likes to place video and images into the general Google listings if possible. By creating a properly optimised YouTube video and promoting it heavily, it is possible to rank the video for a keyword phrase so that it then appears in the general Google listings. The thumbnail of the video is displayed and this stands out from the rest of the listings making it much more likely that it will be clicked. If it is clicked, the conversion rate from video (as opposed to regular text based web pages) is much higher. 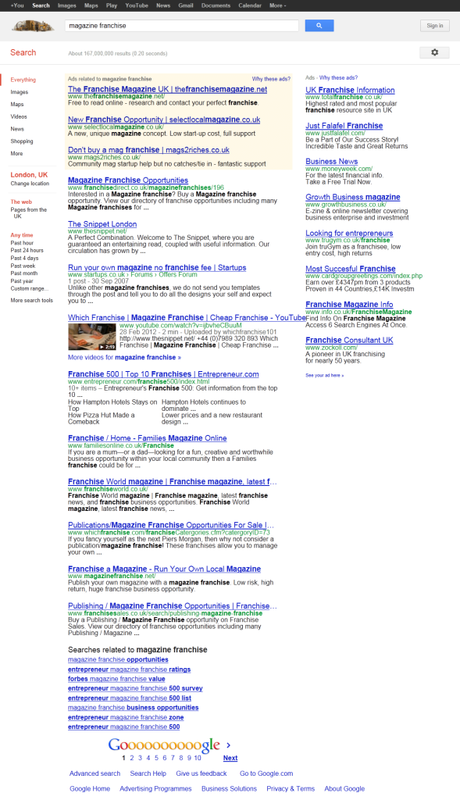 Search for the term “magazine franchise”. Our client is a company who produces the magazine “The Snippet”, you can see that their website rates highly for this term, but further down the page we have also managed to rate their YouTube video, which stands out in the listings.